From AMC's hit television show The Walking Dead come this Daryl 7-Inch Action Figure! This 7-inch figure sports a spectacular likeness of actor Norman Reedus, taken from 3-D scans of the actor himself. 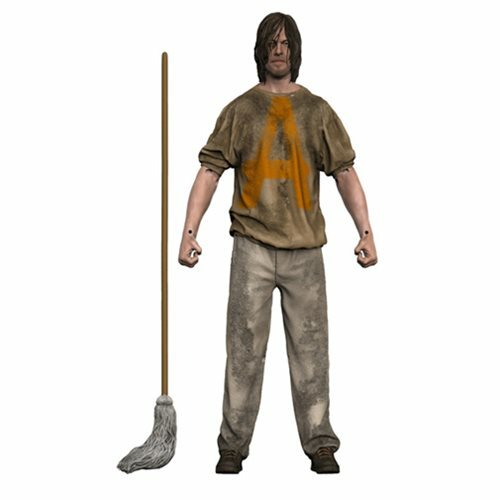 Daryl is featured in his savior prisoner outfit and his mop as seen in season 7. Complete with 15 points of articulation, this Walking Dead Ezekiel 7-Inch Action Figure comes with a stylized Walking Dead branded display base and showcased in window box packaging. Ages 12 and up. After Negan executed some members of Rick's group, he instructed the Saviors to take Daryl hostage. Taking Daryl as an insurance policy, Negan informed Rick that he would comply with Negan's rules, or else his prisoner, Daryl, would suffer dire consequences.